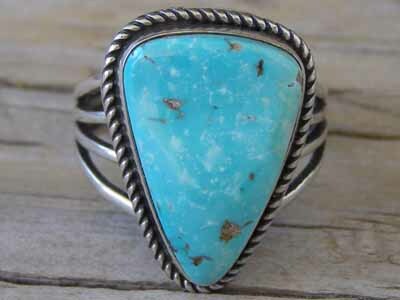 This ring features a stone of natural, untreated Turquoise Mountain turquoise from Arizona. The stone is set in a smooth bezel wrapped with twist wire which forms the border of the ring face. The shank consists of four lengths of Sterling round wire, fused at the back of the shank but spread apart in front before attaching to the ring back. Albert did not hallmark this ring, but he stamped it Sterling on the ring back. We guarantee this ring was made by Navajo silversmith Albert Jake. Ring face: 7/8" x 11/16"